United States President Barack Obama selected Pittsburgh as the venue for this week's Group of 20 (G20) summit because it is a shining beacon of regeneration. When the steel industry from which it grew imploded in the 1970s and 80s, it survived and thrived by shifting its economic base to healthcare, technology and financial services. The second largest city in the state of Pennsylvania and just over 300 km from Washington, it has also weathered the recent global financial meltdown, adding jobs when most have been shedding them. 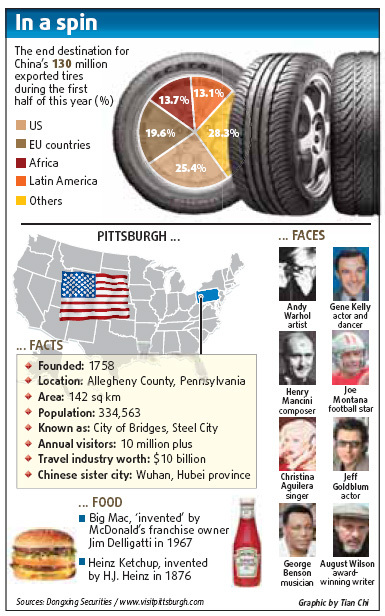 World leaders are desperate to know the secret to Pittsburgh's success but, when they gather today and tomorrow for the first time since the London G20 talks in April, there will be an elephant in the room. If ignored, it could mean resolutions from the summit may prove flawed and, at a time when the global economy is showing signs of recovery, there is much at stake. The "elephant" is protectionism and it made its appearance following Obama's decision on September 11 to approve raising the tariff on all passenger vehicle and light truck tires imported from China for three years. 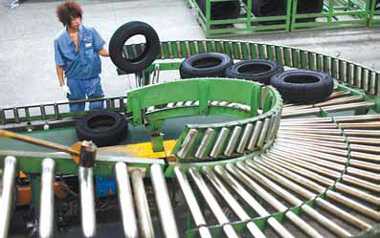 The move answered calls by US unions, who blamed the growth in imports of Chinese-made tires for the loss of thousands of jobs. China reacted angrily, claiming the move violated rules set down by the World Trade Organization (WTO). Yao Jian, spokesman of the Ministry of Commerce, accused the Obama administration of acting without sufficient proof and bowing before domestic protectionist forces. China shortly after announced plans to investigate complaints that automobile and chicken products exported from the US benefit from government subsidies and are being sold in China below market prices. Beijing also filed a complaint on the new tariffs with the WTO on September 14, starting a 60-day period of negotiations between the two sides. If that fails, China can request a WTO probe and ruling. What happens after that is anyone's guess, but some fear the worst. "This step ... sends the wrong trade protectionist signal to the world," said Yao. "Although the world economy has shown positive developments, the outlook for revival remains tortuous, and rampant trade protectionism can only delay the course of recovery." The greatest fear about the tariffs is the danger they could spread to other industries, with the WTO already investigating a ban by the White House on Chinese poultry imports. China is the largest chicken export market for the US, generating $722 million last year and $393 million in the first seven months of this year. The nation exports about 20 percent of its annual chicken production, worth an estimated $5 billion. Before the tire tariff was announced, the US denied allegations by Beijing its poultry firms were receiving government subsidies and selling products, mainly chicken feet, below market prices in China. The situation is grave, according to Hubert Tse, an Australian lawyer based in Shanghai who specializes in foreign direct investment and mergers and acquisitions. "China nor the US want to get into a trade war. It's not in their interests, but many people around the world fear the tariff could lead to strong retaliatory actions from China," said Tse. "There are a lot of companies in China and the US watching the development of this dispute, as well as the probe into pricing of US chicken and auto products, very closely because the situation might prompt US producers of steel, apparel or other goods to file similar safeguard complaints against Chinese imports. "Companies don't want to be caught up in this as it will hurt sales in what is already a very challenging global environment but there are a lot of people out there who want to see China retaliate against the tariff hike to warn the US about playing fair in global trade." Eswar Prasad, a professor in trade policy at Cornell University, New York, and a former head of the International Monetary Fund's China desk, agreed. "A trade war between these two major economies could disrupt the world trading system and stall the fragile global economic recovery. Heightened trade tensions could also hinder progress on important multilateral initiatives, including tackling climate change and promoting reform of the international financial institutions," he said. The effects of the tariff are already being felt in China, not least by workers at the nation's tire molding plants. Hangzhou Zhongce Rubber Co Ltd employs around 20,000 staff at its factory in the capital of Zhejiang province but bosses say they plan to make 5 percent redundant because of the duty hike. Zhou Xiaojun, 37, who has worked at the plant for nine years, lives with his wife and 11-year-old son in the suburbs in a 9-sq-m room that costs 400 yuan ($60) a month to rent. "My son is studying at primary school now but I will need more money to support his education in the future," he said. "I know there will be job cuts because of this distant dispute. At my age, it would be difficult to find another job that is as stable as my current one. "No one will benefit from this dispute. It hurts Chinese people and also US consumers." Minsitry of Commerce spokesman Yao said: "The US trade relationship is one of China's most important and the ministry's priority is to promote and further develop it." He promised China would take measures, including making use of the China-US Joint Commission on Commerce and Trade meeting next month, to resolve the friction. China and the US are each other's second largest trade partners.